Let’s continue creating our menus! The equipment menu will list all equipment parts of a combatant and allows changing the equipment. Additionally, a combatant info will display the changes to status values a selected equipment will make. Add a new menu screen and change the following settings. Click on Add Menu Part and than on Equipment. The equipment part will manage a combatant’s equipment – change the following settings. We want to keep the order in which we added the equipment parts. This will add a button to unequip weapons and armors from an equipment part as the first button in the list. That’s it for the equipment part. Click on Add Menu Part and than on Description to add a description part. Change the following settings. That’s it for the description part. Click on Add Menu Part and than on Combatant – we’ve already used a combatant part in the Overview menu, but this time we’ll use it to display a single combatant and the changes a selected equipment will do to the status values. Change the following settings. This will use the current user combatant of the menu. By default, the user is the player. Click on Add Status Element to add a HUD element to the combatant part. Change the following settings. Again, click on Add Status Element and change the following settings. Copy the last status element and change the following settings. This allows displaying a preview of a status value based on a selected equipment. And that’s it for the equipment menu screen. The ability menu will list all abilities a combatant. Similar to the inventory menu, we can separate the abilities by ability type. Click on Add Menu Part and than on Ability. The ability part will display a combatant’s abilities – change the following settings. And that’s it for the ability part. It’s time to add our new menus to the overview menu. In the Button List part, click on Add Menu Item and change the following settings. 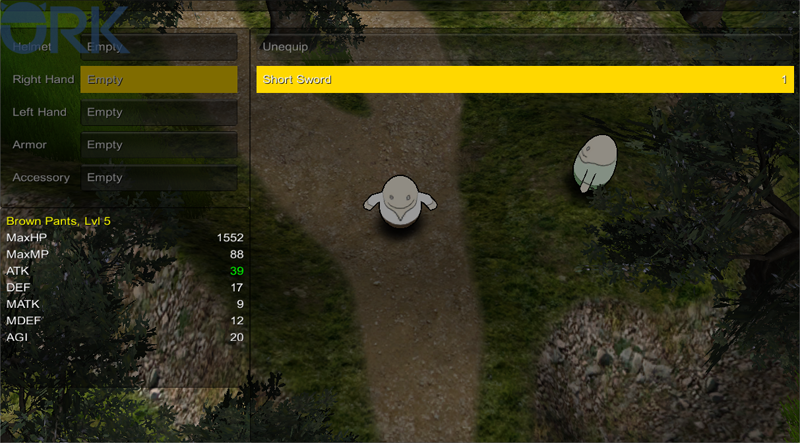 This will display a combatant selection before opening the menu screen. The selected combatant will be the user of the menu screen – we’ll use this for future group members. Set to: Change your equipment. Again, click on Add Menu Item and change the following settings. Set to: Show your abilities. This leaves the status menu and some other settings. And that’s it for now – the next lesson will continue with menu screens.